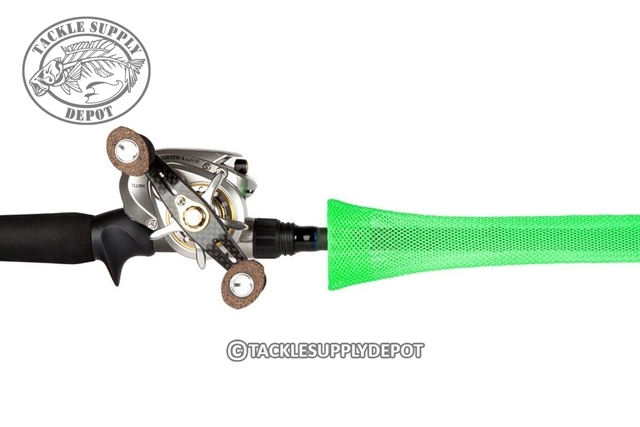 The Shorty Rod Glove Casting Model will cover guides on rods from 5ft 6in to 6ft 6in in length and provide an expandable diameter of 5/8in to 1-5/8in. The Rod Glove is a premium protective slip on fishing rod cover which is 100% made in North America and used worldwide by hobbyist to top level pros alike. The expandable mesh material design is resistant to UV, Mold and Mildew meaning while keeping rods covered and protected the covers will remain clean and looking good trip after trip. The additional benefit with the mesh design of these covers is hooks can more easily be removed by pushing the material together to create the needed space for allowing hooks to be removed unlike sewn materials on the market which would require cutting and damaging of the covers. Top pros on the circuits such as Gerald Swindle, Brent Ehrler, Dave Wolak and Gary Dobyns rely on The Rod Glove to not only protect the equipment they count on but to allow ease for organization and excellent time management on the water. Each cover is made with Tapered Tips perfect for any rod locker, expandable sleeving which can be additionally sized if required and provide an ideal easy on/off for the rods as well as an array of colors to suit personal preference or for color coding instances so when reaching into that rod locker you always know what rod your pulling out. Fight Fish, Not your rod cover. Fits on a 6’9â€ jerk bait stick perfectly!